In a little more than 2 weeks, I’ll be able to take possession of my “grail” game. 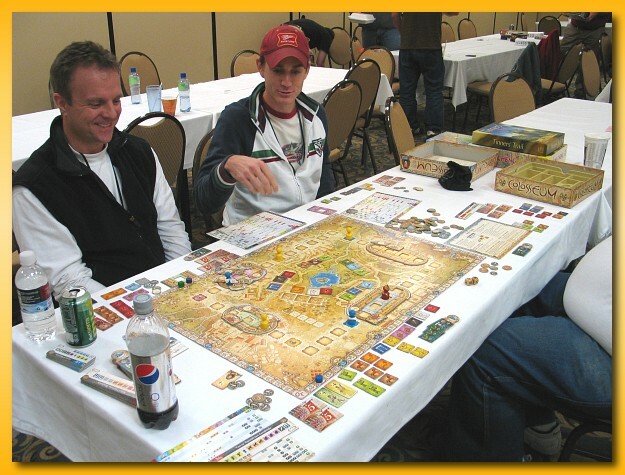 I was lucky enough to be invited to attend the Great Lakes Games Convention at the beginning of November where not only many of the newly arrived Essen games will be unwrapped and played but I also found someone willing to part with their copy of Tal der Könige. Tal der Könige is long out of print and it’s relatively difficult to find copies for sale in the states. It seems to be more easily found in Europe but as luck would have it I stumbled into this sale and I won’t have to pay shipping. So what’s a “grail” game and what’s so special about Tal der Könige? 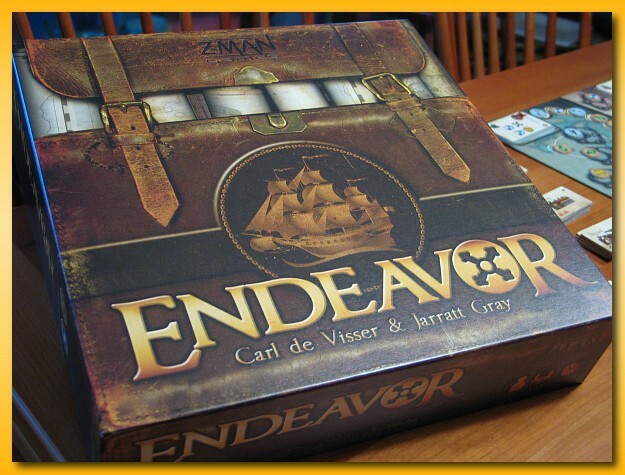 A “grail” game is a game that, for an avid board gamer, falls in the “must have” category for whatever reason (rational or otherwise). They’re usually hard to find and/or very expensive and obtaining a copy represents the culmination of effort, patience, and unfortunately usually money. Relatively speaking, Tal der Könige isn’t ranked very highly. But it isn’t a slacker either at 6.72. Designed by Christian Beierer, it was published in 1992 by Kosmos and supports 2-4 players for about 60 minutes. It comes in a horrific neon and triangular (yes…triangular) box but the game itself is very beautiful. 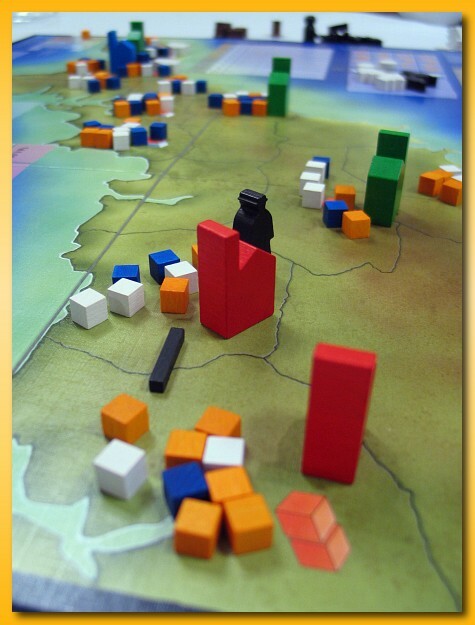 The game requires players to bid, bluff, auction, steal, pillage, and scrape together materials to build pyramids on the large triangular board. The game presents some nice “screw your neighbor” opportunities so it may only play well in the right crowd. But, for me, the biggest drive to obtaining a copy was that the game just looks damn cool. My latest BGG image upload for Primordial Soup. I finally beat Lisa in a game of Dominion. Did you feel it? Yes…the end of the world is surely just around the corner. Author mattPosted on October 17, 2009 January 27, 2016 Categories All Posts, Board GamesLeave a comment on Breaking News! Yeah that one…way up there…no…the one on the left! I’ve been trying, although apparently without measurable progress, to contain my game collection to a cabinet/shelf unit to the right of a large armoire in a common area in our house. It was a losing battle and games had begun to pile up on top of the game cabinet. Where do you put 130+ games? At times I needed to stand on the arm of the couch, lean out, and stretch to grab some of the boxes perched precariously near the ceiling. For me, the guy that can throw out his back while flossing, the “maneuver” bordered on extreme sports. As my will power waned and as time progressed I ran out of room and, unfortunately, right next to the shelf was an expansive flat spot…the top of the armoire. In my house, flat spots emit light and sound proportional to their flat-spottiness. Light and sound like that found only behind cherubic halos coupled with choral music announcing epiphanies; a beacon to all that needs piling and stacking. I’d recently gotten lazy (only recently?) and when returning “top shelf” games to the shelf, I’d placed them on top of the armoire rather than mustering sherpas, donning oxygen tanks, and climbing Mt. Everest to find a spot on top of the game shelf. I’d not taken the time to restack the games and the number of games on top of the shelf had dwindled to a respectable (is that even possible?) size numbering only 8-10 games; the treeline of my game mountain. However, the top of the armoire, proving to be a highly fertile area, produced games in numbers above 20; a side effect of not only lazy restocking but also the release of pent up board game acquisitional behaviors. Author mattPosted on October 12, 2009 January 27, 2016 Categories All Posts, Board GamesLeave a comment on Yeah that one…way up there…no…the one on the left! Click and thumb if you’re so inclined. CABS held their 10th annual Buckeye Game Fest this past week(end) and I had a great time. I attended Thursday and Friday nights, worked in the games library and registration desk, and played games for most of Saturday. By Saturday evening I was exhausted and thought it best to head home. Unfortunately I started getting a sore throat by Saturday night so it’s probably a good idea that I didn’t push it and try to attend on Sunday. You can usually find somebody to play about any game you can imagine. CABS has over a thousand games in their collection and available for check out with just a driver’s license or credit card. 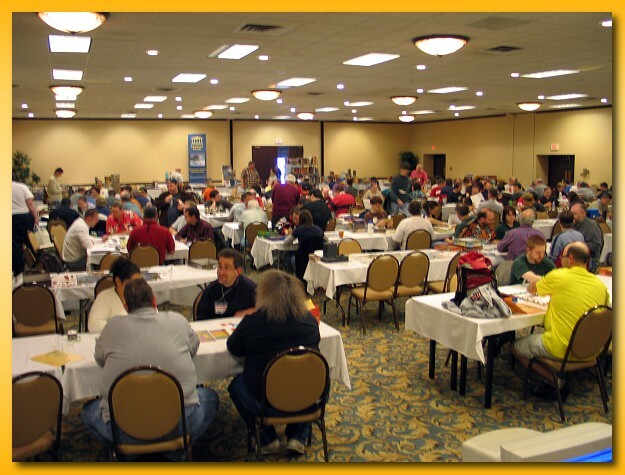 The convention is run relatively well and for the most part it’s a giant open gaming forum. There are some fixed events and small tournaments but in general it’s all about providing a big space for people to play games to their hearts content. But it can be rather daunting to the uninitiated. Working at the registration/library desk exposed me to all kinds of people and I really tried to help the people that made the attempt to come to the con but seemed overwhelmed by the choices. The tables can be somewhat clique-ish and if you’re shy at all about talking to “strangers” or asking to sit in on games you’ll find yourself with nothing to do but stand around wondering why you came. I think the convention could benefit from a bit more scheduled items catering towards the new people…the families and couples that like games and made the huge step of even coming but aren’t ready to drink from the gaming firehose. 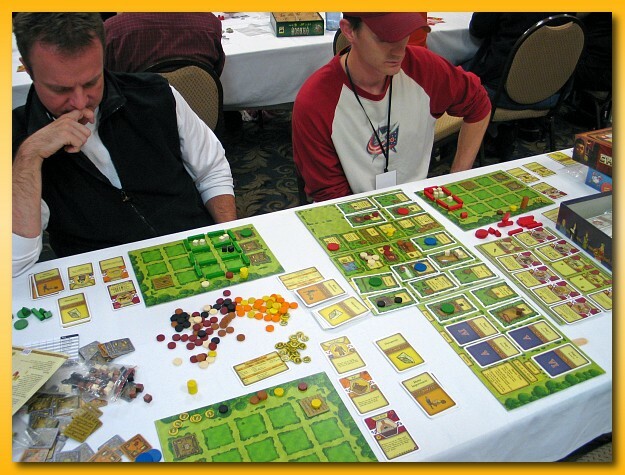 Something like reserving 3 or 4 tables for one “gateway” game being taught by someone who can manage all the tables but isn’t necessarily playing. CABS was giving away a free game to every registrant, why not teach those games to people? I don’t have a lot to say about each of these images but they do represent a few of the games I got to play (when I remembered to snap a picture). I’m already looking forward to next year.